"Difference is as natural a thing as breathing. Infinite varieties exist of everything under the sun. Civilised society has a duty to accommodate suitably differences among human beings. Only in this manner can we give due respect to everyone's humanity. No one should have his or her dignity trampled upon or human rights denied, merely on account of a difference, especially one that poses no threat to public safety and public order." During a press conference held Tuesday morning, November 13th, Ms. Valini Leitch, Human Rights Coordinator for The Society Against Sexual Orientation Discrimination (SASOD) read the media release from SASOD, URAP, Guyana Trans United. Then Mr. Nigel Hughes, Attorney-at-Law, who was one of the lawyers who worked on the case commented on the ruling saying, “This decision, certainly in terms of Guyana, is perhaps the most significant decision given by the Caribbean Court of Justice on the saving law clause, on the issues of discrimination, and on the issues of secure protection under the law.” The full press conference can be seen below. This decision gives all of us who are fighting for legal gender recognition hope that policies and laws across the Caribbean will become more trans-inclusive and respect the inherent dignity and contribution of trans and gender non-conforming persons. The opening poetic lines of the judgement from the Hon. Mr. Justice Sanders sums it up adequately and indeed - 'No one should have his or her dignity trampled upon or human rights denied, merely on account of a difference, especially one that poses no threat to public safety or public order'. Congratulations to the litigants, legal team and the tremendous collaboration from URAP, SASOD Guyana and Guyana Trans United. For background on the case, back in July, OutRight shared this article about the case: “”Crossdressing" Case Raises Deep Issues of Human Rights and Social Justice for Region”. The article gives details about the case that started when on February 6, 2009, seven persons were arrested under the 1893 Summary Jurisdiction (Offences) Act section 153 (1) (xlvii) for being a “man’, and in ‘any public way or public place’ and for ‘any improper purpose’, appearing in ‘female attire’, which is a summary offence. They spent the weekend locked up at Brickdam Police Station in Georgetown in Guyana. 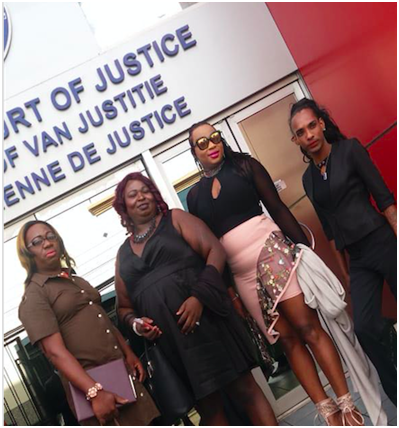 We congratulate the four litigants, URAP, SASOD Guyana and Guyana Trans United and the lawyers for their sustained diligence to fighting for human rights and being validated for their tireless work by the CCJ confirming that trans rights are human rights.